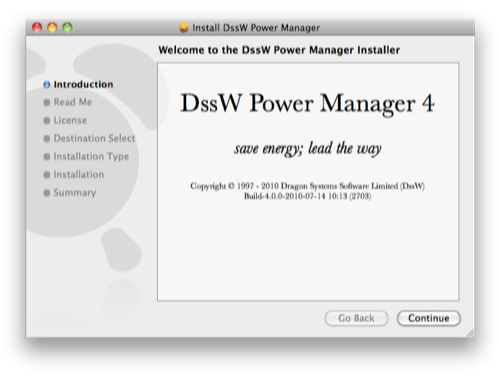 To install Power Manager, open the DssW Power Manager.mpkg file within the mounted Power Manager disk image. You can double-click the package icon to open it. 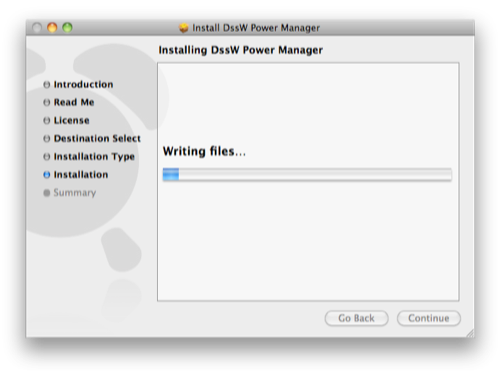 The Power Manager package will open in Apple’s Installer application. The Installer will walk you through the installation process step-by-step. 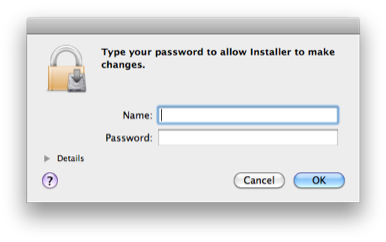 To complete all the installation steps you will need administrator privileges for your Mac. These privileges are required by the installer to place files in locations outside of your home folder. Power Manager affects everyone who uses your computer, so only users with administrator privileges are allowed to install Power Manager. The sequence of steps presented by Apple’s Installer differs depending on the version of Mac OS X you are using. The main steps listed next will always appear. The Introduction step displays the distribution’s full name and version details. The Read Me step provides an opportunity to read the latest release notes about this specific Power Manager distribution. 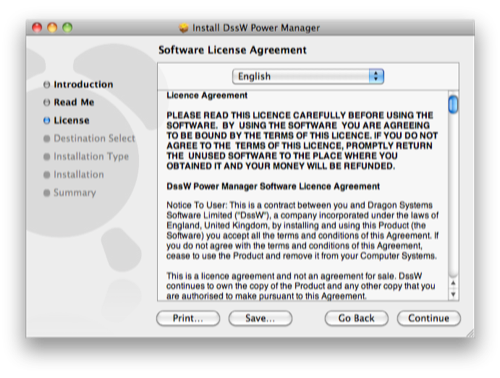 The License step presents the formal license agreement that you must agree to before continuing the installation or using Power Manager. The license agreement is important. If you do not agree with the license agreement, do not continue with the installation. The Installation Type step provides an overview of the installation’s storage requirements and destination. 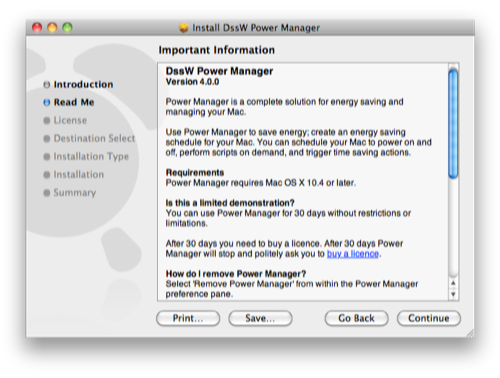 Power Manager can only be installed on the active System drive because Power Manager needs to place files in special locations within Mac OS X in order to work correctly. You can choose not to install some parts of Power Manager. We recommend you install everything by choosing the Standard Install; this is the default option. Before you can install Power Manager, you will need to demonstrate that you have administrator privileges. This is done by asking you for an administrator user name and password. In most cases, this will you be your normal user name and password. By entering your administrator details, you are authorising the Installer to place files outside of your home folder. The Installation step performs the copying and installing of Power Manager files onto your Mac. This step will take a minute or two to complete. After the installation has finished, the final Summary step is displayed. 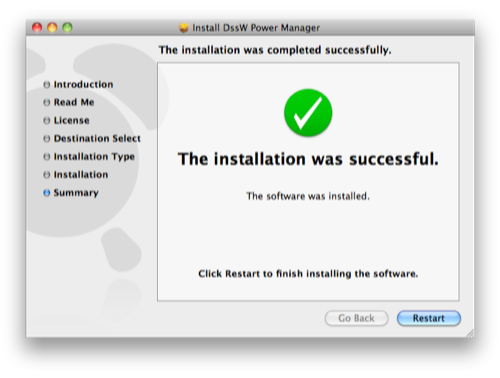 If all went well, you can now restart your Mac and begin enjoying the benefits of Power Manager. A restart is required because Mac OS X’s architecture does not support launching Power Manager’s assisting agents in the required security sessions, mid-session. Apple is aware of this limitation and will hopefully present a solution in a future version of Mac OS X. Until then, the only recommended method of starting Power Manager after a clean installation is with a restart.